Some years back, I received a surprise donation from a client’s family, an F2 Savannah cat named Kimbu. Here are some notes from my research on Savannah cats and personal experiences with Kimbu. Savannah cats are hybrids that result from the breeding of an African serval and a domestic cat. Serval cats are medium-sized African wild cats with long legs, spotted coats and large ears with a circular mark on the back of the ears. They usually weigh between 11 and 20 pounds. What Does the “F” in Hybrid Cat F 1-5 Mean? All Savannah cats are assigned a Filial Designation, F1-F5, which describes how close the Savannah cat is to its exotic ancestor. As an F2 Savannah, Kimbu is somewhere between 25% and 37.5% serval. An F1 is 75% serval (Dad is serval and Mom is 50% serval). The USDA defines all hybrids as domestic. This certainly can be misleading, in that behavior and the genetic makeup of hybrids differs from domestic cats in many ways. Can a Savannah Cat Legally Live With Me? Savannah cats are prohibited in Massachusetts, Hawaii, and Georgia. 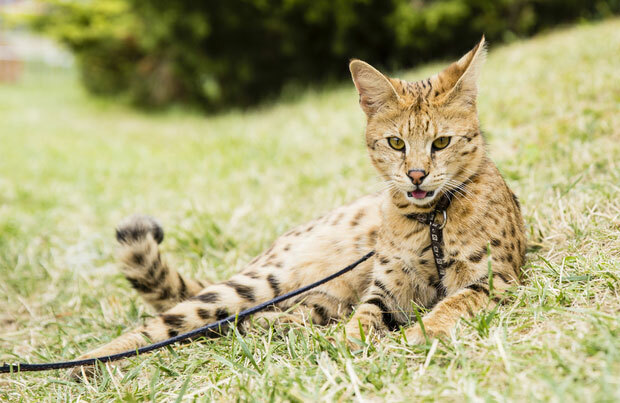 New York State only allows Savannah’s that are greater than five generations removed from the serval (F4 or F5). New York City prohibits ownership of all hybrids. What Makes Savannah Cats Different? There are differences in serval and domestic cats that make the ongoing breeding of Savannah cats challenging. First of all, the length of pregnancy is seventy-five days for the serval and sixty-three to sixty-five days for the domestic cat. Secondly, some serval males can be “picky” about breeding with a domestic female, making it difficult to find a tomcat that will successfully breed. Thirdly, male Savannah’s are usually sterile until the F5 generation, although Savannah females are fertile from F1 forward. It has been reported that male sterility is on the rise in F5 and even F6 males. Differences in pregnancy length and other genetic factors lead to increased fetal deaths. We don’t really know what percentage of hybrid kittens don’t make it, since actual statistics on fetal deaths haven’t been published. Today, Kimbu spends most of his time in a tall, spacious enclosure with shelves to climb on and a covered house to hide in. He doesn’t mind wearing a harness and enjoys leisurely leash walks. He likes to inspect objects slowly and cautiously but has never been comfortable with other cats. He will attack other cat or turn his aggression to me when he gets near other cats or is “spooked” by sounds, smells and unfamiliar sites. I have never let him walk freely because I am afraid he will hurt my other pets or human visitors. Not all Savannah owners have these experiences, especially with F4 and F5 cats. Remember, the larger the F designation, the more they are to behave like domestic cats. I have pondered and reflected many times on whether my choice to keep this cat as a pet was a responsible choice. Am I sending the message that I support and even promote the cross breeding of wild and domestic cats? Is it safe and humane to co-mingle these species? Would a typical cat household without a veterinary owner be safe and satisfying for Kimbu? I certainly don’t have all the answers. My advice for those considering acquiring a hybrid is to spend some time with the cats at the breeder, study videos, and speak to other Savannah cat owners. If both you and the breeder socialize the kitten to humans daily in the first weeks of life, they are more likely to interact positively with people. Plan how to create a stimulating feline environment and a safe home for all who will interact with your unique and beautiful cat.